The Virginia Cardinal Award is VASBO's premier recognition given to one of its members each year for exemplifying professionalism, leadership, and innovation in the field of school business management. The award winner is announced at the Spring VASBO conference. 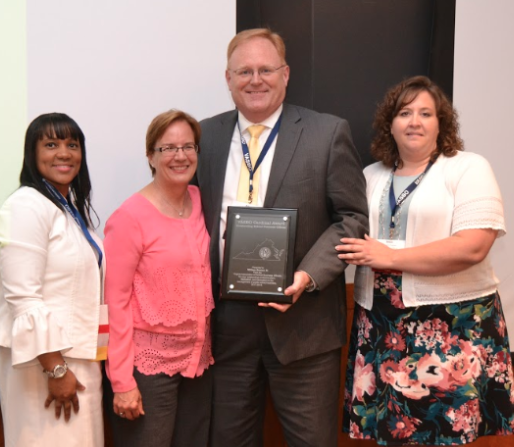 The winner also attends the Southeast Association of School Business Officials (SASBO) the following year and is recognized as the Outstanding School Business Official for the Commonwealth of Virginia. Nominations are accepted year round but close on March 1st for the current award year. If you know a member of VASBO who has made a significant impact in local and state school business finance, please complete the Cardinal Award Nomination Form and email it to Debbie White at [email protected] by March 8, 2019. As we have every year since 2009, VASBO members nominates some of their outstanding peers. The 10th Cardinal Award winner is Bill Bowen, Chief Financial Officer for York County Public Schools. Mr. Bowen has over 28 years in the accounting field including the last ten in public education. Mr. Bowen has had the privilege of working with three very dynamic school divisions and superintendents: Poquoson City with an average daily membership of about 2,100 students, Henrico County with an average daily membership of about 50,500 students and York County with an average daily membership of about 12,600 students. Mr. Bowen has been a member of VASBO since 2008 and has had the opportunity to serve in various capacities. Specifically, Mr. Bowen served as past president of VASBO (2016), president-elect (2015), treasurer (2014) and director (2011-13). Mr. Bowen has certainly left his footprints on VASBO as he played a key leadership role when it came to VASBO creating its first Strategic Plan. According to his Superintendent, Mr. Bowen is a proven leader across the Commonwealth of Virginia in all areas of governmental finance and extremely worthy of this award. Mr. Bowen is focused, deliberate and results oriented as an alumni of Christopher Newport University where he earned his Bachelor of Science in Accounting. Mr. Bowen is overall an exceptional visionary leader who is a strategic thinker who is committed to serving others. He leads with humility, courage, wisdom and compassion. Mr. Bowen congratulations on being the 2018 Cardinal Award Winner. Bill Bowen receiving his Cardinal Award.